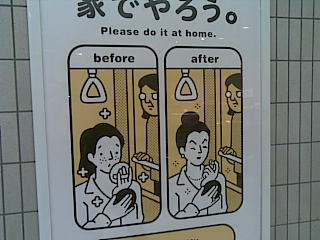 Dont put makeup on in the train. Again I dont know why it bothers people. Maybe its the smell of the cosmetics? Fear of being smacked with a flying lipstick or sprayed with perfume? I definitely hate the tension of watching the lady across from me apply mascara on an bumpy ride. Or it could that the makeup transformation is a private act and should be done at home. . I suspect this one is about the boundaries shifting between the public and the private. Things that were once private are increasingly becoming public, and the conservative folk in train management feel like they have to make a statement against the turning tide. I’m amused by the amount of English on the poster. I think the English invasion of the language is more of a threat to Japanese society than moves in the public/private divide. I sat next to a girl doing her makeup once, I was kinda amused. And then i heard the sound of a lighter. I looked around, and she was holding a hairclip in the flame, and then using the clip to curl her eyelashes. Wow. I really stared, not cos I was impressed by the technique (tho im not saying the the technique was not impressive) but because I thought an open flame on a crowded train, and right next to me, was a bit over the line. She was undaunted and did it again (she had to do the other eye). I started doing the throat clearing cough, ready to say something, in addition t the staring and she looked at me as if to say “mind your own beeswax” and moved onto the next stage of makeup application. I was mildly astounded.